National Democratic Congress has announced that it recognizes Taiwan as a sovereign state. The party has since declared that it does not recognize the One China Policy. In a statement released on a Thursday evening, NDC Secretary General Mwenya Musenge says the party is extremely disappointed with the action by the Chinese communist party who have openly thrown their political weight behind the governing PF government. 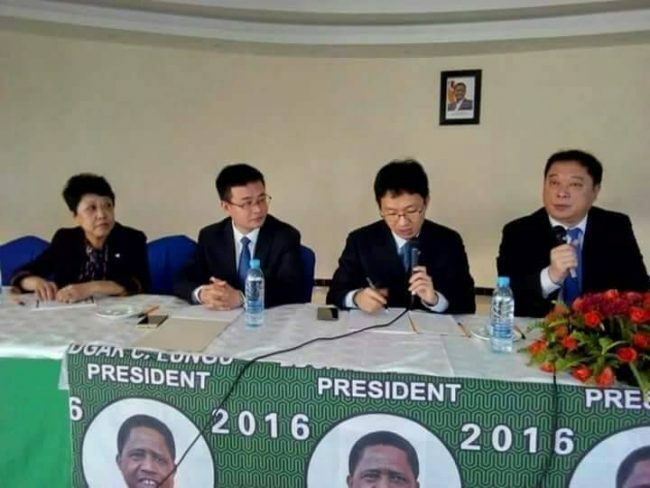 Mr Musenge said that it is now evident that the Chinese Government is indirectly supporting the PF thus interfering in our internal political space. “In this regard, the NDC wants to make it clear that we do not as a party recognize the one china policy. To this effect, the NDC recognizes Taiwan as a sovereign state,” Mr Musenge said. He said the NDC leadership will in due course travel to Lilongwe, Malawi to formalize it’s ties with that country. “Instead if pursuing economic diplomacy, China is directly interfering in our political affairs as an independent state. The NDC leadership will henceforth write a diplomatic protest letter on the continued undue interference in our domestic affairs,” he said. Mr Musenge said the Chinese communist party and its Government has clearly crossed the red line by associating and supporting the pf.